Considering how huge online gambling has become in Canada, your best bet is to play at one of the industry-leading sites packed with so many games that you'll never get bored. 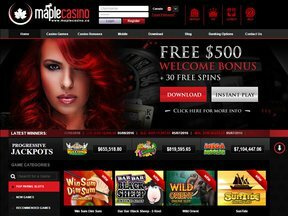 Maple Casino mobile is just the place to go, offering big promotions and longevity. They've been in business since 2001, and they've clearly stood the time as they are still one of the biggest casinos in the industry. The Vegas Partner Lounge Group owns Maple Casino mobile, along with a few other online gambling sites. They are licensed by the Lotteries and Gaming Authority of Malta, eCogra certified, and powered by software from the industry favorite MicroGaming. The eCogra symbol of approval means that all the games offered have been thoroughly tested for fairness, and the MicroGaming symbol indicates that you can expect nothing less than state-of-the-art software that is of impeccable quality and very user friendly. They are continually updating their software and adding new games monthly, and you can download the software straight onto your computer or play in the no-download flash mode, or on your mobile device. Maple Casino mobiles one-ups most competitors by giving you a choice of two great bonuses that are structured very differently. One of the biggest bonuses on the market is their $3,000 "free play" no-deposit required reward. The conditions require you to play fast, because you only have one hour to use the $3,000 credits, and when the hour is up the bonus is not yours to keep. But, you can keep any winnings up to $100 provided you make a deposit of at least $40 and make 20 or more real money bets. The other bonus is in the form of matching on your first three deposits up to $300. Basically, for your first deposit, there's a 100% match up to $100; the second deposit is a 50% match up to $100; and the final one is a 200% match up to $100. The required playthrough for each deposit is 50x the bonus, but only slots and parlour games count 100%. Since other games count substantially less, this benefit is best used strictly for slots. Every time you play, you earn loyalty points called C-bucks which can accumulate. You can later redeem the C-bucks for credits to your account, free spins, and other stuff. The casino has a 4-tier Loyalty Lounge Program where tier status (Green, Silver, Gold, or Platinum) is determined by the number of C-bucks you earn. As you move up in levels, your rewards increase accordingly. Another nice touch is the birthday reward that they offer everyone. MicroGaming is never stingy when it comes to game variety, and this site's no different. There are over 600 titles available, making it one of the largest online gaming sites out there.